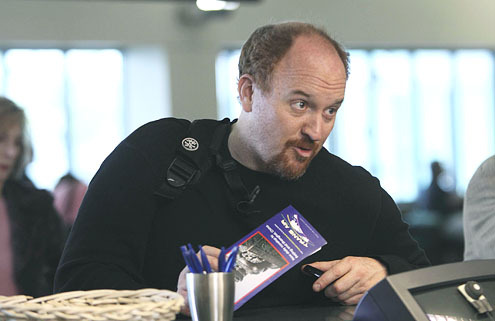 Louis C.K.’s critically acclaimed show Louie’s fourth season runs as two episodes every Monday night. Rather than just answering the question of “are these episodes good,” (because the answer is always yes) we’ll talk about the big lessons imparted in each episode. This week: Louie’s back hurts and he has to open for Jerry Seinfeld. Welcome to this! Maybe it’ll work and maybe it won’t. That sentence had to come up in the pitch for Louie, so it’s as good of a place to start as any. I love Louie very deeply. I even loved Louis C.K.’s tonally similar movie. Louie is always going to mean different things to different people, but to me it means hope for the hopeless. The “world” of Louie is brutal and mean, but it is not without victory. After an extremely long hiatus, Louis C.K. had to come out swinging to remind people what both the world of Louie and the character of “Louie” are like. The first two episodes definitely do that. “Back” opens with the best joke structure possible: Big gets bigger. Louie wakes up in New York City to the sound of garbage men. Of course, they break into his house to jump on his bed and dump trash on him. His life literally gets worse from the moment he wakes up. It’s a fitting start to an episode that’s mostly about how hard it is to get older. Louie always features stand up bits that weave the vignettes together; the one about hating a 31-year-old for complaining about aging will hit too close to home for a lot of people. Louie’s back goes out and a gruff doctor, an unfazed sexshop worker, and Todd Barry don’t have any time or interest in consoling him. Anyone with a passing knowledge of Louie or a working sense of dread will see the first twist in “Model” coming. Louie has to open for Jerry Seinfeld at a benefit. He doesn’t get enough detail and thus ends up in a T-shirt at a black-tie affair full of millionaires. The first 10 minutes is every bit as agonizing as you’d expect, but it’s when the episode turns to the model herself that it socks you in the gut. Probably not, and that’s more than fine. What’s more interesting is the lesson itself, revealed in the scene with the credits: It’s never all bad. ← Worst Best Picture: Is The Bridge on the River Kwai Better or Worse Than Crash?